In this online exhibit you'll see how athletic skill, determination, and public support help explain Wisconsin's dominance of long-track speed skating. Between 1976 and 2002, speed skaters born and raised in Wisconsin won 13 Olympic medals. In 1976, Peter Mueller and Dan Immerfall became the first Wisconsin natives to win Olympic speed skating medals. 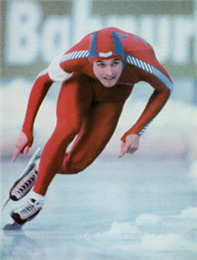 Eric Heiden of Madison reached the pinnacle of Olympic success by winning five gold medals in 1980. Mueller, Immerfall, and Heiden, along with Eric's sister Beth and later competitors Dan Jansen, Chris Witty and Casey FitzRandolph, represent the high caliber of Wisconsin speed skating talent.